When Man Man cut their seemingly endless tour short to take a long-overdue break, Ryan Kattner A/K/A Honus Honus A/K/A Man Man's main man made something he'd avoided for the past 13 years—a solo album. A portrait of Ryan Kattner, A/K/A Honus Honus. If you tune into a TV show called “The Exorcist,” you expect to hear your fair share of strange voices. But the most surprising sound for Philly music fans came – not in the form of a demonic growl or a Satanic roar – but via the unmistakable tones of Honus Honus last month. “Santa Monica,” a tune from the Man Man founder/frontman’s new solo debut "Use Your Delusion," blasted from a car stereo in the opening minutes of the Fox series’ third episode as a pair of ill-fated characters engaged in some front seat flirtation. It turns out Mr. Honus had an “in” with the show. Using his other name, Ryan Kattner, he currently serves as music supervisor for the network adaptation of the horror classic. Surprisingly, given the subject matter, that’s mostly entailed placing deep-cut northern soul tracks rather than jump-scare cues, but given his history of singing, “Will you harness the 666?” (on Man Man’s “End Boss”) or posing as a corpse at the Louvre on Instagram, the show still seems a good fit. “I guess you do get back the energy that you put out into the universe,” Kattner said over the phone from his car, somewhere in Los Angeles recently. A former film student, Kattner left Philadelphia for Los Angeles nearly four years ago, picking up the threads of a screenwriting ambition that was sidelined when he “decided it would be fun to write some songs and see what happens,” and Man Man took off unexpectedly. He’s since taken to what he calls the “unique weirdness” of his newly-adopted city. “I’ve been trying to move out here forever,” Kattner said. His own dreams don’t seem to be in any particular danger at the moment. In addition to his new found solo project, he works as music supervisor for both “The Exorcist” and the quirky YouTube production studio, Super Deluxe. He also recently co-starred with Mary Elizabeth Winstead in the short film, So It Goes, and directed videos for three of the songs on his new album for the JASH YouTube channel, which was founded by Sarah Silverman, Michael Cera, Reggie Watts, and Tim & Eric. 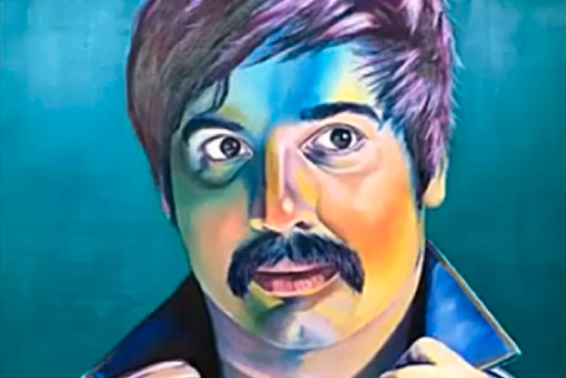 Despite having his own name (well, his own pseudonym at least) on the album cover, Kattner says the process didn’t differ much from writing for Man Man. “I feel like the only way my music is going to lose [its strangeness] is if someone does a lobotomy on me,” Kattner laughed. “I just wanted to write hooky pop songs that were fun to play and that people would want to listen to on repeat. Is that so wrong? As for the fate of the band, Kattner simply says that its members needed to take a break, but he shrugs off any suggestion that his Hollywood career and solo project indicate Man Man’s imminent demise.